INTRODUCTION As part of the New Anglia Local Enterprise Partnership Culture Board, a working group of key stakeholders in the cultural lives of children and young people in the region has been convened. Together, the members of this working group and their networks have high ambitions to significantly increase and enhance the opportunities for Norfolk and Suffolk’s children and young people to experience a rich and varied cultural education throughout their childhood. To support this important ambition, Festival Bridge will invest £250,000 in cultural education in the New Anglia region from 2019 to 2022. This investment can only be released when at least 100% match has been secured. The following information outlines how we want to work with partners to grow this investment and achieve significant outcomes for children and young people. WHO WE ARE 1. The New Anglia LEP Culture Board New Anglia LEP Cultural Board was created specifically to work with the LEP and to play a clear role in contributing to the LEP’s strategies for growth. We have fashioned a new approach to culturally driven growth in the region which will increase ambition and collaboration with our creative, business, tourism, education and public sector partners. 2. The working group for Cultural Education The members of this working group bring together key stakeholders from cultural education in the New Anglia region. Members of the working group have significant reach, influence and networks in formal and informal learning and cultural provision. The working group has the following aims: •	Adopting and promoting Arts Council England’s Cultural Education Challenge ensuring it is meaningful for all children and young people in Norfolk and Suffolk. •	Responding to the priority objectives identified in the ‘Culture Drives Growth’ strategy and New Anglia Cultural Sector Skills Plan by encouraging local networks of sector professionals to collaborate. •	Share information and intelligence regarding the challenges and needs of children and young people across the area. •	Supporting Local Cultural Education Partnerships (LCEPs) including identifying opportunities for collaboration between LCEPs. •	Maximising the impact and reach of Partnership Investment funds in accordance with the Festival Bridge Partnership Investment plan ensuring partnership agreements are in place with partner organisations. •	Facilitating connections between localities and relevant regional activity. •	Facilitating connections between cultural education and other county, regional and/or national programmes, strategies. 3. Festival Bridge Festival Bridge is delivered by the Norfolk & Norwich Festival Trust. It is one of ten Bridge Organisations working across England with investment from Arts Council England and the Department for Education. Bridges work to radically improve the cultural education offer by creating, advising and facilitating partnerships and networks in the places in which they work, including by the strategic use of Partnership Investment to encourage growth. Festival Bridge provides support, advice and guidance to inspire educators and practitioners, helping them to ensure children and young people’s creative and cultural experiences are the most valuable they can be. These partnerships are guided by Arts Council England’s Cultural Education Challenge and are supported by the work of Festival Bridge. However, because each partnership is shaped by the needs, capacities and opportunities of the place, no two partnerships are quite the same. Each partnership brings together key leaders from culture, education and wider community development. They are partnerships that are open to all who have an interest in creating real improvements to the opportunities available to children and young people in their locality. WHAT IS PARTNERSHIP INVESTMENT As a part of their funding agreement with Arts Council England, Festival Bridge allocates 25% of the Arts Council England funding to Partnership Investment. Partnership Investment aims to attract and secure new sources of money not traditionally spent on arts and culture for children and young people in the LCEP areas. For the period 2018-2022 this allocation has been divided between New Anglia, Cambridgeshire and Peterborough, and National projects. 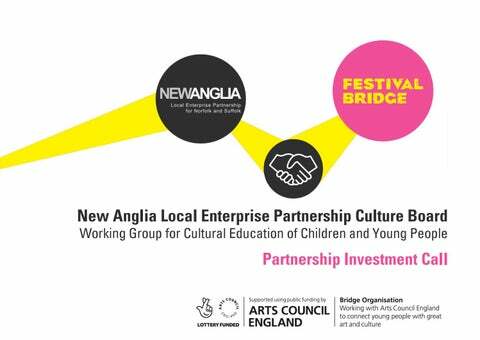 For the New Anglia region Festival Bridge is working with the New Anglia Culture Board’s Working Group for Cultural Education for Children and Young People to maximise the values, reach and impact of this investment. Arts Council England has produced the following statement to detail the scope of Partnership Investment: The Arts Council expects that Partnership Investment will support the strategic development of Local Education Partnerships as a priority focus wherever possible. This may include resource to support capacity, planning or evaluation of LCEP progress. Investment outside of this scope will only be agreed in exceptional circumstances. Our ambition is that LCEP areas will continue to grow and thrive over the next four years and we consider Partnership Investment to be central to this success. Partnership Investment must not be used to facilitate programme delivery, it is not an alternative to project grants and the Arts Council will not support the approval of applications where this is the case. Our ambition is that Partnership Investment will support local areas to create new financial sustainability for cultural education. Therefore at least 100% match funding must be sourced from alternative non-arts income. This cannot include Lottery funding or support in kind. Bridge Organisations will support LCEP partners to develop their cultural education offer locally and will be able to advise on how Partnership Investment can support their strategic development and future sustainability. Key Criteria: •	Investment can only be released at a minimum of £1 for each £1 invested. Our ambition is that applicants achieve match at a higher ratio. •	The minimum amount that can be invested is £25,000. •	Investments must contribute to the strategic development of a Local Cultural Education Partnership. •	Co-investors must be strategic not delivery partners. •	Match cannot be from Arts Council or Lottery funding, or be support in-kind. 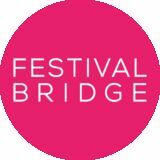 Festival Bridge Priorities for Partnership Investment: Alongside the headline ambitions at the top of this document Festival Bridge prioritises Partnership Investment that: •	Demonstrates co-creation between sectors and/or young people. If not in the development of the proposal, co-creation must be realised through the outcomes of the proposed investment. •	Provides quality assurance for outputs, particularly through the use of Artsmark, Arts Award and the Quality Principles for work with Children and Young People •	Contributes to the Festival Bridge research and development priorities: a. Early Years Cultural Education b. Skills Development c. Wellbeing d. Digital e. Proving impact of cultural education f. Children and Young People’s Voice •	Enables new partnerships and/or new ways of working. •	Supports sustainable and resilient organisations creating a return or longer term gain for children and young people. There is a strong interest in using Partnership Investment alongside different models of finance such as enterprise investment or social investment activity, which might increase the sustained impact of the investment. HOW TO CO-INVEST WITH US Partnership Investment is intended to be agile and responsive to both need and opportunity in the New Anglia area. We welcome approaches from any organisation interested in working with us in this way and encourage early dialogue with the Festival Bridge through our Senior Manager for Norfolk & Suffolk Rachel Macfarlane at rachel@nnfestival.org.uk, and/or an LCEP. As we are working through a collaborative approach to ensuring the greatest impact for this investment we have designed an application process that is light touch for those looking to invest whilst open to scrutiny from the sector partners to ensure impact. Applications to the second round must include an LCEP as a partner. Visit nnfestival.org.uk/partnershipinvestment to download the application forms.